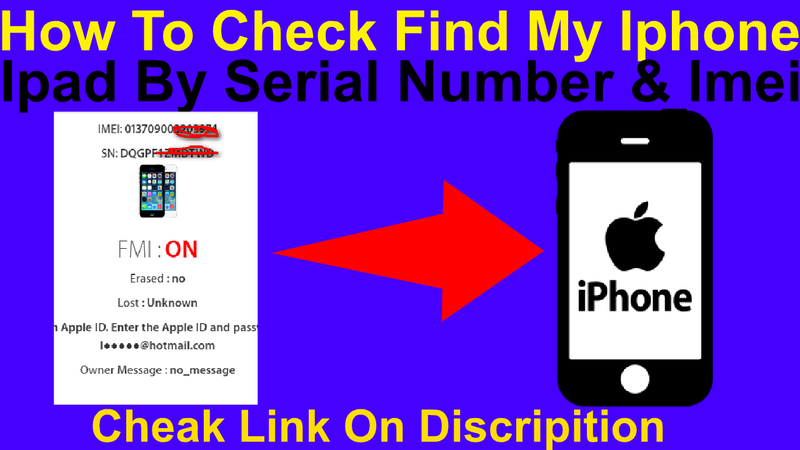 Home / How To Check Find My Iphone & Ipad By Serial Number & Imei / videos / How To Check Find My Iphone & Ipad By Serial Number & Imei. As Apple removed the icloud activition lock page, and if you wondering if there is a way or a website which will tell you whether an iPad is locked to iCloud or not. You have a few of them but they only give you icloud status using IMEI. This new icloud serial check status are available online for free to check if your icloud is ON or OFF to all devices non GSM. This works for all serial Ipads and Ipods. This tool also can give you the gowner msg if the device locked or the icloud id reference. This tool just for WiFi devices iPod, iPad WiFi, iWatch. How to check FMI with serial. How to check Find my IPad by serial number. LINK FOR ICLOUD STATUS WITH SERIAL.